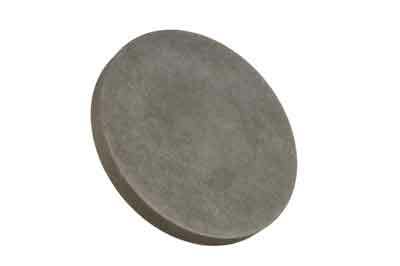 The T&J Tools diamond disc is a 125mm (5in) diameter by 12m (1/2in) thick steel impregnated disc with diamonds, giving a grit size of around 300-350. Solid in construction, it is currently produced with a 10mm (3/8in) arbor welded to the back. The disc can thus be fitted into a Jacobs chuck within the headstock of the lathe. For added security, a protective homemade wooden cap can be placed over the running tailstock centre and brought up with light pressure to the front of the disc to remove any safety concerns. For this test, I decided to sharpen as many variations of tools as I could. The disc can be used dry or with an application of WD40 type oil, which I found to make the sharpened edge keener. Firstly, I sharpened some M2 HSS traditional ground gouges, with the aid of the toolrest in front of the disc face for support. The lathe speed was around 300rpm but it can be run faster, if required. However, due to the efficiency of the diamonds, there is really no need. 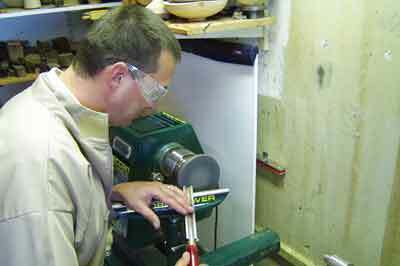 Due to the slow running speed I found it easy to grind the tools by hand without using a jig. This produced a very sharp edge with a flat grind instead of a hollow grind - this being a benefit with the skew chisel. Next, I sharpened various fingernail profile gouges. While it took some amount of practice to get the hang of this, as I normally use a sharpening jig, due to the slow running speed I found it much easier than on a standard grinding wheel. I also produced a fine edge on some scrapers by turning the tool over, thus creating a fine burr on the tool edge. The outside edge of the sharpening disc can also be used for sharpening parting tools etc. The disc is very simple in design, very versatile and user-friendly. I would easily be able to take the disc to demonstrations for sharpening tools without the fear of a grind wheel exploding. While the chances are remote, with this grinding disc there is no chance at all. ERRATUM: In issue 214, within 'Hot Stuff' we stated the price as being £70.44 (inc VAT). This price was incorrect, please see correct price above. I can certainly attest to the efficacy of this disc. It is simple to set up and use, and produces a wicked cutting edge. The downside is that if this is your primary sharpening mode, you really need to set up a separate motor unit so that you do not have to take the work off the lathe in order to sharpen tools.